My niece, Amanda, was in town this past week visiting from Seattle, WA. While she was here she helped picked peaches and blackberries for the New Albany Farmer’s Market. I sure will miss that help this week, especially since this will be the hottest week thus far this summer. Before she left for her next destination (Cincinnati, OH) I gathered a basket of veggies for her, well tonight she sent pictures of dinner made with our local produce. I thought I would share the photo with you, this may give you an idea for your next dinner. We will have all these veggies available on Wednesday…. If anyone needs me to make them a basket to have ready for pick up, just e-mail me and let me know early Wednesday. I will have your order ready when you arrive on Wednesday. We also have a “Basket of the week” which includes a little bit of everything available the current week. (that is what I made for my niece) The “Weekly Basket” run $25 and always includes fruit when available. 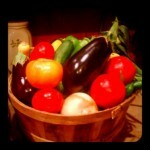 Sample of our "Veggie Basket" we offer each week.